Here are the after school program schdules thus far for 2014. Please see links below for monthly calandars. Children’s Program August 2014 Youth Program August 2014 Children’s program runs Monday to Friday 4pm-6pm and Youth program runs Monday to Friday 7pm-9pm. The Homework Education and Youth program runs Monday to Thurday 4pm-8pm and Friday 4pm-6pm. IRCOM is currently accepting volunteers for all programs. To see what programs require your assistance please click here. Like the tenants, staff, and program attendees who live, work, and play here, IRCOM volunteers often find themselves confronted by new situations. 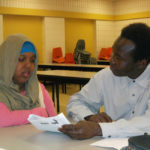 Such was the case for Alex Bakhiet as he looked over the next month’s schedule for the After-School Program one winter day.